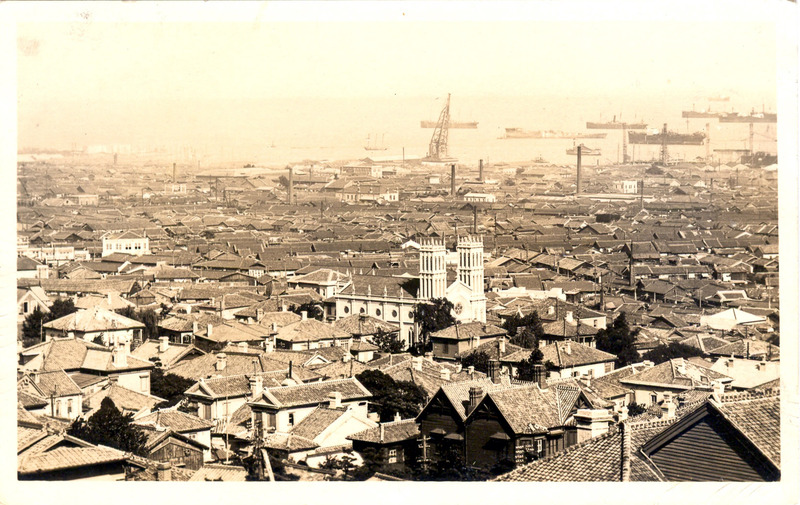 Postcard, c. 1920, depicting the twin-towered Church of the Sacred Heart (center) and a view of the industrious Yokohama harbor. The church would be leveled in the 1923 earthquake. From the wiki: “Portuguese shipping first arrived in Japan in 1543. Soon after, Roman Catholic missionaries arrived with Francis Xavier and the Jesuits in earnest around 1549. The religion briefly flourished, with over 100,000 converts, including many daimyo in Kyushu. But suddenly, in 1587, Christianity was repressed as a threat to national unity and ceased to exist publicly. Many Catholics went underground, becoming hidden Christians; many others lost their lives.